On February 7, 1962, the White House imposed an embargo on Cuba that included food as a punishment for communist Cuba’s support of the Soviet Union. The embargo was eased on several occasions. Most recently in 2014, when President Barack Obama announced the reestablishment of diplomatic relations with the island and a series of actions aimed at reinitiating transactions between the two countries. Soon after, food products from the US started to be exported to Cuba. On June 16, 2017 President Donald Trump announced new travel and trade restrictions and the termination of the agreement between Obama and Cuban President Raúl Castro. “We challenge Cuba to come to the table with a new agreement that is in the best interest of both their people and our people and also of Cuban Americans,” he said. Later that day, Cuban state news informed that “Any strategy aimed at changing the political, economic and social system in Cuba— whether by pressure or imposition or through more subtle means—is destined to fail.” Whether Cuba will come to the table is unclear. What is clear is that the embargo changed the food system of the island and the foodscape of the US. On the one hand, the scarcity of food in Cuba, the ration system established in 1962 and the “Special Period in Times of Peace” of the mid-1990s transformed the diet of Cubans. When ingredients from Cuban pre-embargo cuisine could no longer be found or bought in the island, they were replaced with substitutions to create dishes similar to what Cubans were used to eating so that they could retain their sense of national identity and recognize themselves as Cubans. Nations are what they eat and what are called “platos nacionales” are part of a nation’s self-image. The paradox is that while national dishes are prepared with original ingredients, distinctively characteristic of a territory, according to traditional recipes transmitted from one generation to the next without variations, Cuban cuisine after the embargo was based on a logic of succedanea that countered its uniqueness. A propos of the food substitutions that Cubans began to eat, José Antonio Ponte, in Las comidas profundas, describes how four or five years before the writing of his book in 1997, the sales of meat burgeoned on the island, when there was no meat. Suspicious, the police decided to investigate. They discovered that these ersatz steaks were created from a cargo of cleaning cloths that had previously disappeared. The cloths had been cut into four pieces and submerged in tanks full of lemon juice, where they macerated for a few days. Afterward, they were disguised in beaten egg and sandwiched between two slices of bread. Ponte says that the lie was identified as such by chance. According to him, neither a breach between reality and sign nor any pain in the stomach annulled the trope. In quality, structure, appearance, and mouthfeel, the simulacrum was as it should have been. That the meat tasted authentic revealed that Cubans had already forgotten the sensation of its taste. It appears that these food simulacra inaugurated a new nationalistic cuisine which I call “postnational” that forgot the past but sated the palates of Cubans. On the other hand, the wave of exiles arriving on American shores since the embargo was enacted brought Cuban flavors to American cuisine. Where Cubans settled Cuban restaurants sprang up to recreate old-timers like ropa vieja, arroz con pollo and moros y cristianos. 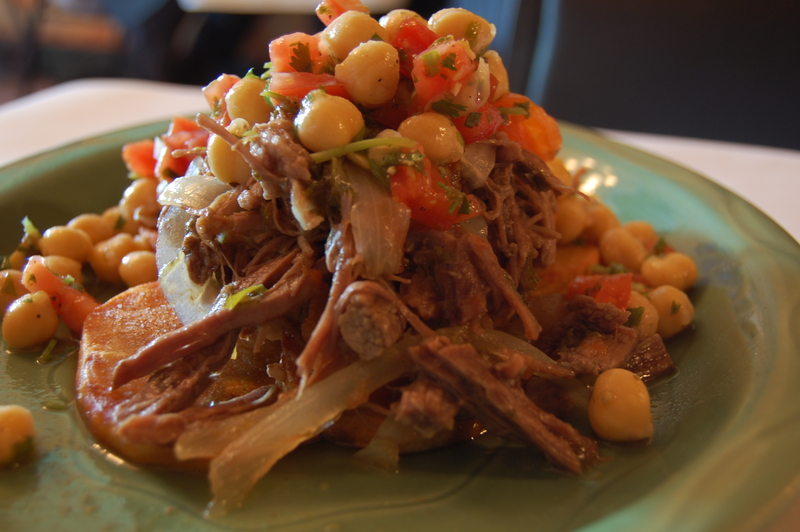 Cuban American chefs promote Cuban culture in cookbooks and on TV. Cuban grocery stores offer selections of traditional Cuban brands which can also be ordered online, even though they have disappeared from the Cuban market. They all feed on a nostalgic economy that reproduces the taste of a Cuba that no longer tastes like itself. “At the Postnational Table,” recently published in Latin American Research Review, examines the forgetting involved in this nostalgia, the amnesia at the center of Cuban cuisine in Cuba and the deep consequences of politics in everyday cooking and eating. Nieves Pascual Soler teaches American Literature at the University of Jaén, Spain. Her research interests cover cultural studies, feminism, food, and popular culture. She has co-edited: Masculinities, Femininities and the Power of Hybrid in U.S. Narratives (2007), Feeling in Others (2008), Stories Through Stories, Theories Through Stories (2009), Comidas bastardas (2013), Rethinking Chicana/o Literature through Food: Postnational Appetite (2013) and Traces of Aging: Old Age and Memory in Contemporary Narrative (2016). Her work has appeared in journals such as Mosaic, Style, Journal of Intercultural Studies and Food, Culture and Society.